Wow; stunning!! I don't think I've seen a more beautiful butterfly; such a brilliant blue. Happy WW and thank you for stopping by and for your comment. 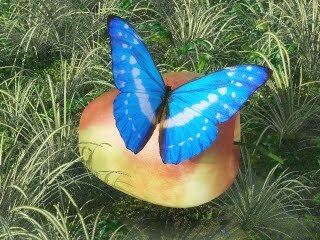 wow..I never see a blue butterfly before! It look very beautiful. Wow. the colors are amazing. Beautiful photo! Lovely photo. It is really beautiful. Wow - looks like a fantasy photo. Great Wordless, here's my Wordless post over at High Strangeness Altoona. If you're feeling saucy click my Alexa link to raise my rating. Hard to believe that those colors are real.